Upon the death of her demonic husband, Hester Prynne is left a widow, and her daughter Pearl, a wealthy heiress. Hester takes her daughter to live a quiet life in England, only to find herself drawn into the circle of the most powerful Puritan of all time, Oliver Cromwell. From the moment Hester donned the famous scarlet letter, it instilled in her the power to see the sins and hypocrisy of others, an ability not lost on the Lord Protector of the Commonwealth. To Cromwell, Hester's sight is either a sign of sorcery or a divine gift that Hester must use to assist the divinely chosen, as he deems himself, in his scheming to control England. Since sorcery carries a death sentence, Hester is compelled against her will to use her sight to assist Cromwell. She soon finds herself entangled in a web of political intrigue, espionage, and forbidden love. 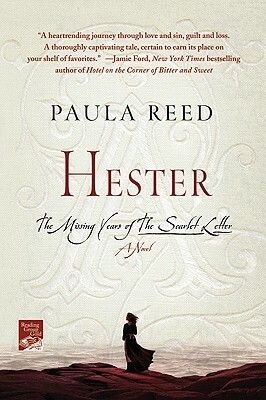 "Hester" will carry readers away to seventeenth-century England with a deeply human story of family, love, history, desire, weakness, and the human ideal. Paula Reed is an English teacher at Columbine High School in Littleton, Colorado. After surviving the tragic shooting there, she, not unlike many students and teachers who were there that day, decided the time to pursue all of one's true passions is now. Paula's passions are teaching and writing.